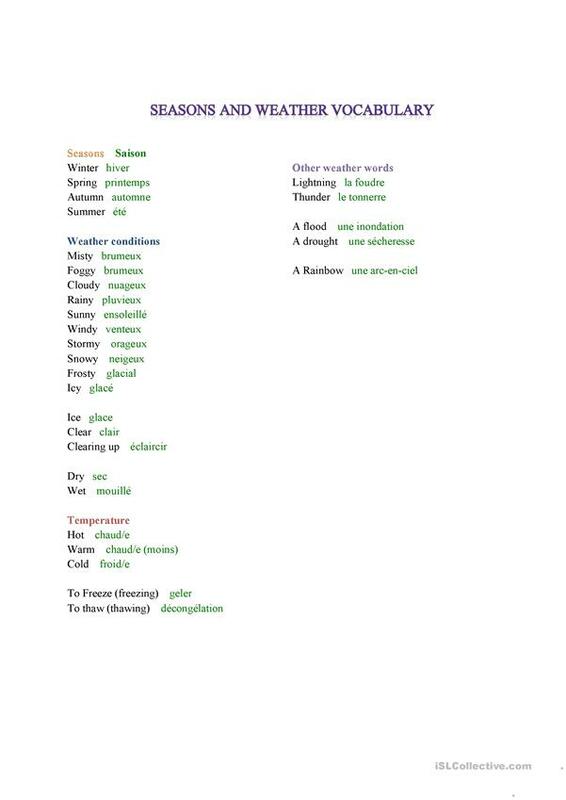 This worksheet compiles some useful words within the category of 'seasons and weather'. The vocabulary is deisgned to inform the students what the words mean. Other worksheets may be used in conjunction after the vocabulary has been presented. English-French. This downloadable handout is intended for business/professional students, high school students and adults at Elementary (A1), Pre-intermediate (A2) and Intermediate (B1) level. It was designed for honing your class' Writing skills. It focuses on the theme of Weather. MissSarahK is from/lives in French Guiana and has been a member of iSLCollective since 2014-11-17 19:49:32. MissSarahK last logged in on 2017-12-14 13:54:57, and has shared 4 resources on iSLCollective so far.